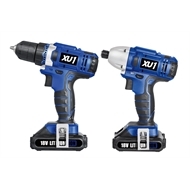 This XU1 2 Piece Cordless Combo Kit features an 18V drill driver, 18V impact driver and 2 x 1.5Ah lithium ion batteries. With 21 drill torque settings and a 110Nm impact driver, you'll be able to drill into timber and fasten bolts and screws with ease. This kit will meet all your household fastening needs and help you get started on your next DIY project. Included battery & charger only compatible with the following XU1 18V products: XDD-180, XHD-180 & XIDK-180. Battery & charger NOT COMPATIBLE with XU1 'BLUE 18VOLT' products.